Whether you're a traditional or modern bride marrying in church or on an exotic beach, in a floor-length ball gown or a slinky contemporary number, there's one item that'll never go out of fashion as far as weddings are concerned - and that's a veil. Top off your cloud of illusion or tulle with a hairpiece that'll draw every eye as you walk down the aisle. The style of your dress will play a very large part in the type of veil you decide on, so don't start choosing your veil before you've found a gown. As with all accessories, if you've chosen an ornate dress, keep the veil plain, and vice versa.Begin by deciding on the length. Veils come in a range of lengths, from shoulder, elbow and fingertip-length numbers to chapel-length (two to three feet longer than a floor-length dress) and the longest type, cathedral-length (four feet longer than a floor-length gown). The correct length of your veil depends on two things - the style of your dress and the setting you're getting married in. Anything longer than hip-length is only appropriate with a full-length gown - a trailing veil looks very odd behind a knee-length dress. Chapel- and cathedral-length veils are best worn only in church for two reasons - first because they're in keeping with the traditional setting, and second because of the stone flooring, which lets the veil slide across rather than snagging on carpet or getting caught in chair legs. If you're dying to wear a long veil but aren't getting married in church, employ a page or two to hold it up as you walk. Decide whether you want just a single layer of veil, or whether you'd prefer to go for two or three layers of fabric. A multi-layered veil looks more luxuriant, but can be overkill with a plain dress, so consider using trimming to beef up the look instead.Trimmings, beading and embroidery go a long way toward making your veil stand out from every other bride's. Most veils have a bound edge, which can be done with satin stitching, ribbon or lace. Embroidery or beading in a huge variety of different colours and styles can also be added to match or contrast with your dress. Most veils come attached to an 'invisible' comb, which simply means it's placed on the underside of the veil so it can be inserted into the hair without being on show. You can also buy veils attached to a tiara or headpiece, or purchase your own headpiece and a veil with a gathered top edge that you can attach yourself. Decide how you're going to wear your veil before you put it on. The comb can be attached anywhere at the back of the head if you're planning to leave the veil trailing down your back, but for those who want to pull the edges of the veil around their face and shoulders, the comb needs to be anchored on the top of the head so the material hangs correctly. Brides going for the traditional 'lifting' when they arrive at the altar are also best off attaching the veil to the crown of the head, allowing the veil to fall evenly in front and behind. Veil combs need plenty of hair to cling onto. If you're wearing your hair in a swept-up style, it's easy to push the comb in at the crown or base. Leaving your hair loose means you'll probably need a few extra hairgrips to make sure the veil stays in place. In both cases, styling products and hairspray will give the hair a stickier surface, making it easier to secure the comb. Tiaras are the most popular hair ornament at weddings, and can be worn with or without a veil. There's a massive variety of styles to consider, from coronets to simple bands, covered in flowers, frills or sparkling gems. Whichever you opt for, make sure of two things - first, that it's in keeping with the style of your dress, and second, that it won't be obscured by your hairstyle. 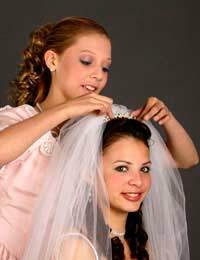 Take your tiara along when you go for your dry run at the hairdresser, just to make sure it can be clearly seen. Less ostentatiously, you can add trimmed combs or clips at the sides of your hair, which can also be used to keep your veil in place (a tiara's usually not robust enough to anchor a veil on its own). Make sure you add even numbers at each side of your head if you want to use them for securing the veil, and add some hairgrips as back-up. If you're looking for a less traditional adornment, try a fascinator - a large hair ornament perched on an 'invisible' wire, usually made from flowers or feathers. Such a bold statement will be overkill when combined with a veil, so don't overdo things by adding one. Finally, don't feel that just because you're not wearing a big white frock, you can't wear a veil. Now that veils come in a variety of colours from pastel shades to burgundy and silver, there's bound to be one that'll match up with your dress perfectly. After all, you'll probably only get one chance in your life to wear a veil - so go for it!